Free wine will be provided for the first toasts for the opening of the latest edition of the VINARIA 2013 International Exhibition of Vine-Growing and Wine Producing which will be held in Plovdiv this week. The wine barrels will be placed at the Stefan Stambolov Square, which is the final stop of the traditional Dionysus procession dedicated to the international wine and vine expo and festival held in Plovdiv. The procession will start at 12 p.m. on Tuesday, April 2 from the Roman Stadium Square and will end up at the square in front of the Municipal Office. Citizens and guests will have the chance to taste the wines of popular winemakers and enjoy a performance by Trakiya folklore ensemble. The Dionysus procession is just one of the art events in VINARIA 2013�s programme. Bulgaria is among the countries with longstanding traditions in winemaking and VINARIA is one of the most representative wine industry events. 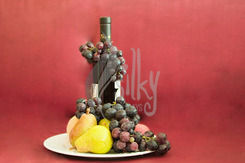 The exhibition has contributed to the success of many wine producing and trading companies. VINARIA brings together leading companies from the most important industry sectors relating to vine-growing and wine producing. The event serves as a centre for exchange of information, presentation of innovations and technologies through the numerous conferences, seminars, presentations and business meetings included in the parallel business programme.